This degree program of study for Diploma Registered Practical Nurses prepares students for the challenges and opportunities of practice as Registered Nurses. Students enter the McMaster-Mohawk-Conestoga BScN program in year two, building on the foundational knowledge and skills acquired in their diploma nursing programs. Students are integrated into the BScN program through classroom and clinical learning experiences designed to expand their nursing knowledge while supporting their transition to a problem-based learning curriculum. In addition to providing a solid scientific nursing base, this degree program emphasizes problem solving, team skills, critical thinking, research informed practice, and leadership competencies. The curriculum is planned for three academic years of full-time study. Upon successful completion of the program, graduates will be awarded the BScN degree by McMaster University. Applicants must provide evidence of registration with the College of Nurses of Ontario; newly graduated applicants must have written the Practical Nurses Registration Examinations by June 30th of the year of application and all applicants must provide evidence of successful registration with the College of Nurses by August 15 of the same year. A diploma in practical nursing (two-year program) from an Ontario College of Applied Arts and Technology, or equivalent, with a minimum overall average of 75% or higher. (Higher averages are often required for admission due to competition for available spaces in the program.) Applicants who have satisfactorily completed a diploma practical nurse program but who have not achieved the required cumulative average may become academically eligible by completing at least twelve units (two full-courses or four half-courses) of university degree credit with a cumulative average of at least B (75%). This work can be in any subject area and will be used for transfer credit once the applicant is admitted to the Post-Diploma Practical Nurse to B.Sc.N. program. Note: Applicants who possess a certificate in practical nursing should seek upgrading to diploma practical nurse at a College of Applied Arts and Technology. Students are integrated with Conestoga Site Collaborative B.Sc.N. students (Stream A) of the McMaster Mohawk Conestoga B.Sc.N. program for most courses. This is a limited enrolment program. Possession of the minimum admission requirements does not guarantee admission to the program. All applicants are required to complete an online assessment (CASPer™) as part of the admission process. Further information will be sent to applicants after the application has been received by Conestoga. University degree credit courses completed prior to admission will be assessed for transfer credit by the Office of Co-ordinator of Studies following admission to the program. Please note, offers for this program will not be going out until all CASPer test results have been received which will be by mid-April. Students are responsible for all costs associated with becoming certified in CPR-HCP level and in maintaining this certification during the program. In addition, students are responsible for costs associated with respirator fit testing required for clinical practice. Travel within the program: Students are responsible for arranging their own travel to and from learning settings external to the College and for covering all costs incurred. 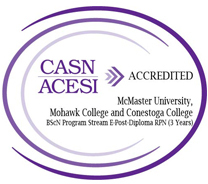 Upon receiving the BScN degree from McMaster University after successful completion of this program, graduates are eligible to write the National Council Licensure Examination (NCLEX). The College of Nurses of Ontario (CNO) requires all applicants for registration to provide a recent criminal record synopsis (CIPC check) as part of the RN registration process. If you have any questions related to the Regulated Health Professions Act, please contact the College of Nurses of Ontario directly at 1-800-387-5526. For more information about the curriculum for the RPN to BScN program, please refer to the McMaster website.